In order to put the "flesh on the bones" of this document it’s necessary that you assess the external trading environment and undertake an internal performance review. To pick out a few key facts that will persuade a prospective buyer to go to the next stage of the purchasing process. If you like, it’s an audit, although not in the same forensic-like manner of an accountant. It can be as detailed as you wish, but more importantly it requires a clear focus on the purpose, in this case completion of the corresponding sections in the Sales Memorandum. It’s also an opportunity to anticipate specific questions a buyer may ask later in the process, enabling you to think of good answers and to map out your tasks in preparation for Due Diligence, which takes effect once a firm buyer has been identified. What, specifically, makes your business stand out from the competition? ExitAdviser’s Sales Memorandum tool takes a practical approach designed to make completion of this important document as easy as possible for you. There’s a specific How-to Guide to explain how to use the tool, so here we concentrate on gathering the right information inputs. It’s important to pay particular attention to the following parts of the Sales Memorandum. The specifics of the "Key financial facts and forecasts" (absent from the above list) is covered in a separate How-to Guide. In addition the research and analysis you do will have an important bearing on the accuracy of forecasts used in the Business Valuation Tool (BVT). The more you know about these external and internal factors, the better you’ll be able to justify your assumptions made in the BVT. Due Diligence is also a very detailed process requiring you to have the relevant facts and figures available to the buyer or their representatives. It’s important for any business to understand emerging trends and their implications for the future, both positive and negative, in order not to be caught unawares. The natural start point is a short synopsis of the current trading conditions facing the business. It’s good practice to use a number of different information sources before drawing conclusions, or at the very least utilize the most authoritative source you can find. On occasions you may require "proxy" data, or parallel indicators, which may be the nearest you can get to market size and share data. Here’s an exercise you can easily do with your colleagues. Take a large sheet of flipchart-sized paper and packs of "Post-it" notes (you may wish to use different colors). The structure and notes are based on the pioneering "5 Forces" work of Michael Porter, the World-renowned American business thinker. Attach the paper to a wall. Ask your team to jot down their individual thoughts under each of the headings, one idea per Post-it note. Take care not to make suppositions. If you’re unsure of the facts, or lack the evidence, note down an action point for further research. Stick the individual Post-it notes under the appropriate headings on the paper. Look for common patterns in the content so that you can group Post-it notes together. Go through the same process, again using Post-it notes, to check for emerging trends likely to affect your business. This exercise covers all five PESTE headings. As you do it, mark each Post-it note with a code to identify each trend type. The objective is not to miss anything that might be important, so think as broadly as you can. Now stick the Post-it notes under the "5 Force" column where you think the trend is expected to impact most. You can duplicate a Post-it where you feel the trend impacts strongly on more than one force. Again look for patterns, grouping the Post-it notes. From these two exercises a picture should start to emerge about what’s important, both now and into the future. Some trends are likely to present opportunities, some threats, others both. Think about the implications on the business and how you, if you were staying on, would take advantage of the opportunities and counter the threats. It’s good to summarize your conclusions in a few short paragraphs or bullet points, adding to this when your follow-up research is complete. Now check back over Section 1 above before going to the Selling Memorandum tool to complete the relevant external business review questions. You can also update existing business plans with the new information. 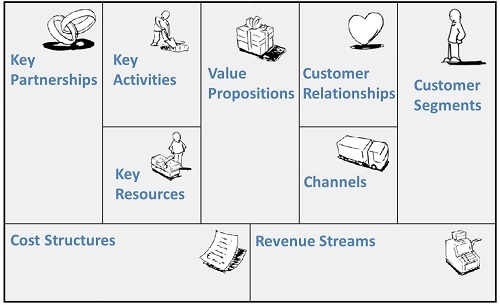 The Business Model describes the way a business creates, delivers and captures value. The most visual approach is the Business Model Canvas (see diagram below), described in the "Business Model Generation" by Alexander Osterwalder and Yves Pigneur. Osterwalder's approach splits the visual Canvas into two halves (a line down the center of the above diagram), one for value and one for efficiency. Think of two containers with four elements in each. Resting on top of the two containers is the central element of the Canvas, namely the Value Proposition, which has both value and efficiency characteristics. Do you primarily solve a customer problem or satisfy a customer need, or both? Do you achieve this by offering the same package of benefits as competitors but at a lower price? Or, like most small businesses, provide a similar offer to the competition but with additional features and attributes (for example, better performance, specific customization to suit individual need, ongoing product servicing, superior design, reducing customer costs or risks, being more accessible than others, or just an offer that is more convenient, or easy to use). This gives you a useful checklist for your internal assessment. It’s advisable to take notes as you go through and conduct further investigation where needed. Customer Relationships, that you have with each customer segment served and whether your key challenge is acquiring new customers or retaining existing ones (or getting them to buy more from you) – so, do you: use your own staff to communicate directly with customers? ; or provide personal, tailored customer service? ; or automate all or some of your processes? ; or have communities of customers allowing exchange of information; or are your customers directly involved in giving feedback on your service or the design of your products? Cost Structure, typically the summation of your Key Resource, Key Activity and Key Partnership costs and dependent on whether your Business Model is primarily driven by reducing costs or adding value to your customer offer – costs divide into fixed and variable and are typically impacted favorably by volume economies of scale or through sharing fixed costs across more than one offer. Based on the information gathered and your analysis you should now be in a good position to go back to the Sales Memorandum and complete further sections. 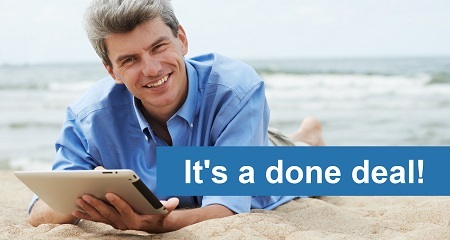 By now you should be well on the way to completing your Sales Memorandum. This specific section, covering the "Main advantage(s) over nearest competitors" question, has been separated from the others for emphasis, because it'll be so crucial in the buyer’s assessment of your business. It’s your main advantage(s) over the competition. The bracket around the "s" is deliberate because in reality most businesses have very few significant, differential strengths over the competition. And, as the buyer will know this, it's important not to overstate your case in the Sales Memorandum. Far better to highlight the one, two, or three (at most) factors that really make the difference, and be ready and prepared to defend your position with the facts. It’s the culmination of all the other information and analysis. The ultimate driver of superior profit performance in the business, compared with your closest competitors, as reported in your financial statements (financial aspects are covered in a separate How-to Guide). For further help with identifying you competitive advantage take a look at the "How attractive is your business to buyers" in the Go-to-Market stage of ExitAdviser. This further explores the demand-side Value Proposition, alongside the configuration of your supply-side Value Chain activities.